Fluence has more than 30 years of experience in delivering water, wastewater, and waste-to-energy projects to the food and beverage industry across the globe. Our unique technologies provide best-in-class treatment for incoming ingredient water, reduce operating costs by turning waste into a resource, and help our customers enhance their products. We have experience providing solutions for breweries, wineries, fruit-juice producers, dairies, slaughterhouses, rendering plants, fish processors, bakers, candy and jam manufacturers, and more. Here’s a small sampling of what Fluence can deliver for your food or beverage operation. We produce the exact quality and quantity of water that customers need to manufacture their products. 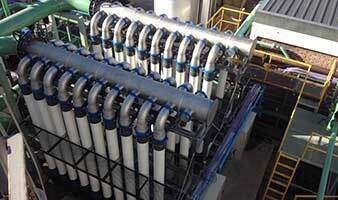 Processes are designed to meet specific requirements, and may include reverse osmosis (RO), ultrafiltration (UF), ion exchange resins, UV, ozone, and advanced oxidation. Fluence has decades of experience in product-enhancement technologies using ion exchange resins, absorbent resins, and membranes. Our innovative solutions are ideal for wine, fruit juice, and whey demineralization, and for cane sugar decolorizing. Fluence is also a global leader in the design of 4SMB (four simulated moving bed) chromatography plants for the purification of fruit juices and the production of organic fructose without the use of chemical reagents. Fluence offers a wide variety of wastewater treatment solutions to food and beverage customers, including anaerobic digestion (waste-to-energy), membrane bioreactors, moving bed bioreactors, aerobic and anaerobic systems, and nitrification-denitrification. We provide nitrogen removal from wastewater, using traditional nitrification and denitrification and an innovative autotrophic biological process, which does not require organic carbon. Both processes convert the nitrogen into gaseous nitrogen without using acids or other chemicals and without generating any by-products. The treated effluent is suitable for direct reuse, or can be further treated with reverse osmosis, activated carbon filtration, or ultraviolet disinfection for the production of process and ultrapure water. Our innovative biomass solutions turn process waste into a resource. Our plants are cost-effective, easy to operate, and low-maintenance. Fluence solutions can be applied to ordinary food waste, complex biomasses, wastewater with high soluble COD concentration, sludge from slaughterhouses, fish processing plants, rendering plants, and more. Fluence’s latest technology development in anaerobic digestion has focused on anaerobic MBR, which combines anaerobic digestion with membrane bioreactor technology to replace centrifuges and dissolved air flotation (DAF) in the concentration of solid digestate. How Can We Help Your Food or Beverage Operation? Our delivery model is flexible and includes equipment sales, turnkey, lease with or without operation, water-as-a-service (WaaS), after-sale support, operations and maintenance, as well as low-maintenance containerized solutions. We are also expert at helping our clients put together a financing solution. If you’re looking for water or wastewater treatment for your facility, contact our experts to discuss your specific project details, and learn how our cost-effective solutions can help you meet your goals and make the most of your assets. Contact us to learn more about our food and beverage industry solutions, or to discuss your next project with our experts. FEMSA, one of the largest bottlers in Latin America, had to increase the capacity of the wastewater plant at its Alcorta facility in Buenos Aires, but there was no room for expansion. Fluence addressed the customer’s requirements with membrane bioreactor (MBR) technology. 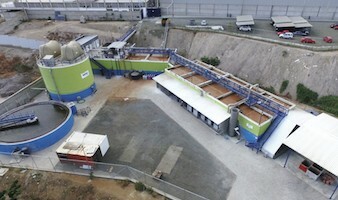 A sequential batch reactor (SBR) was converted into a continuous bioreactor with an Airlift membrane clarification step. With the new technology, the treatment plant can handle higher concentrations of sludge with a smaller footprint than a conventional plant’s. The plant produces treated wastewater suitable for reuse within the plant. Fish processing produces an effluent particularly high in nitrogen and COD. 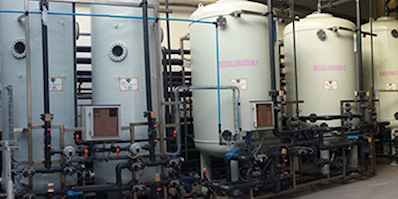 A leading tuna processor in Ecuador wanted to add anaerobic digestion to its plant, but it had to be done without interrupting production. The successful renovation allowed the plant to meet environmental standards and reduce its sludge volume by 75%.